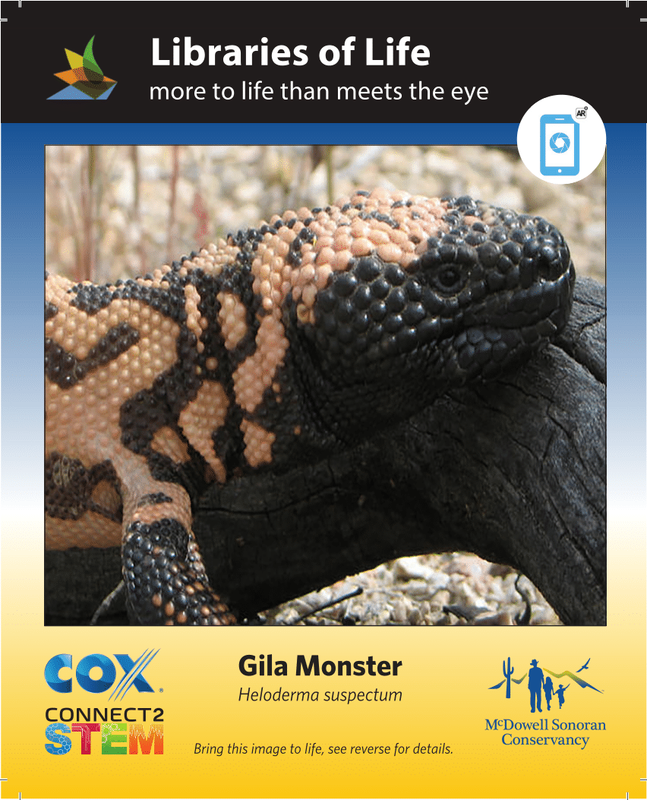 GILA MONSTER: Did you know? ​Gila monsters are slow-moving lizards that can grow up to a foot and a half long. They have black and pink stripes and bumpy skin, thick bodies, and short, thin legs. The color patterns on their skin helps them camouflage under vegetation in the desert. Nothing else looks quite like them! There are only two venomous lizards in the world, and Gila monsters are one of them. However, they only bite to defend themselves. If you see a Gila monster, the best way to not get bitten is to watch them from a respectful distance. Gila monsters live in the Sonoran Desert but you will rarely see them, since they live about most of their lives underground! When the weather gets cold in November they go into hibernation. When it starts to warm up in February or March, they come out to bask in the sun and hunt. Since Gila monsters are cold-blooded, they will only be out when it is warm. Gila monsters need high-protein food, but they cannot chase fast-moving prey like other meat-eaters. Instead, they eat eggs from birds, lizards, snakes and tortoises, as well as newborn lizards, ground nesting birds, rabbits, hares, mice, and rats. They will also eat dead animals, or carrion. Gila monsters can live for up to 35 years in captivity! Gila monsters are protected by law, because there are people who like to collect them from the wild to keep or sell as pets. If everyone collected Gila monsters, there would be very few left. It is important to leave wild animals in the wild, where they belong.